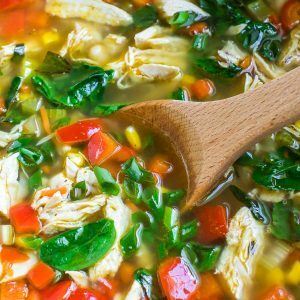 This one-pot chicken and vegetable soup is a weeknight winner in our house and great for meal-prep since it's magically even better the next day! Grab a dutch oven or a large pot and heat to medium-high. Melt your butter until frothy then add the white portion of your scallions (save the green for later), celery, carrot, and bell pepper. Sauté until tender. Add corn, garlic, salt and pepper (start with 1/2 tsp, add more to taste later) oregano, and cumin. Stir well and continue to cook for an additional minute. Add broth, beans, and corn and bring to a simmer, then add your cooked shredded chicken and scallion greens. Cover and simmer for an additional 10 minutes (may simmer longer if you prefer veggies to soften even further) and season with any additional salt + pepper, to taste. Uncover, add spinach and lime juice, and stir. Once spinach has wilted serve with your choice of toppings. Enjoy some today and squirrel some away for tomorrow - the leftovers ROCK! * This would also be a great use of any leftover chicken you may have from meal-prep for the week. I'll frequently roast a whole chicken at the start of the week for salads, soups, and sandwiches, or make a few split chicken breasts (or thighs) in my Instant Pot. So easy and a total lifesaver for throwing together healthy meals during a busy week!